Mullewa is located approximately 100km east of Geraldton. It was once a junction station for the Meekatharra Branch (and it's branches to Wiluna, Big Bell and Sandstone). 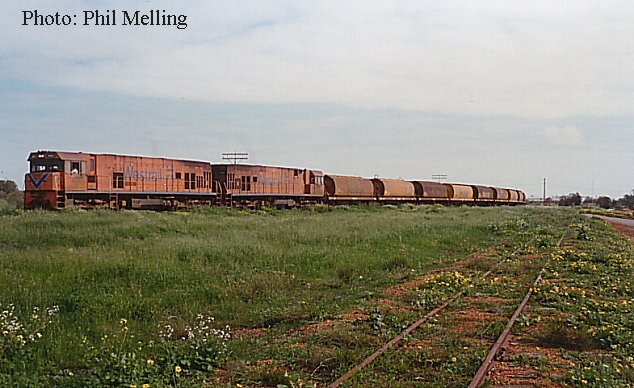 Mullewa once had Railway Refreshment Rooms, a Loco Depot and a yard. Today the only traffic generated from Mullewa is grain from the local Co-operative Bulk Handling (CBH) grain bins. The yard as a single run round loop which extends to the CBH facilities, the latter also use the truncated Pindar Branch for approximately 1 km. Pindar is 30km east of Mullewa, and the rails still exist to the CBH facility there (although not at the loader). 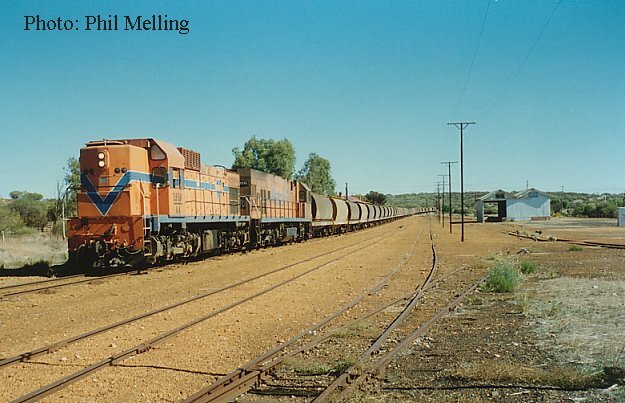 The Pindar line is all that remains of the Meekatharra Branch and services are suspended on the line, but running a train from Mullewa would be impossible as approximately 1 km of track as been lifted just east of Mullewa. The Mullewa CBH facility as been nominated as a Strategic Receival Point so may get upgraded in the future. There is also a possibility that the Mount Gibson Project will see Iron Ore loaded near Mullewa from the Tallering Peak Iron Ore deposit. AA1516/P2013"Shire of Morawa" pause at Mullewa with an empty grain train for Morawa on 5 May 1996. Today only the mainline (on which the train is standing) and the adjacent loop are all that remains of the trackwork. 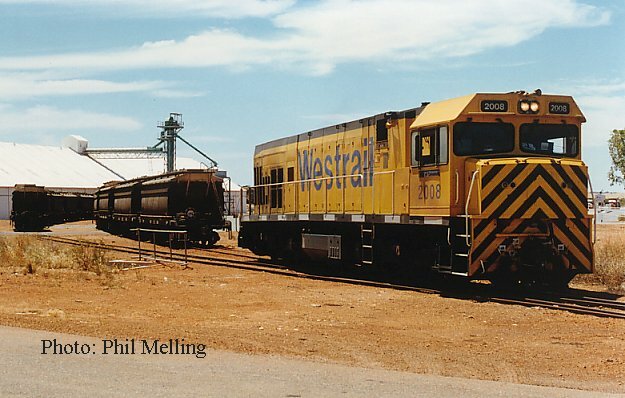 AA1515/AB1536 assist with the loading of a grain train at Mullewa on 4 August 1996. The AA is now in Chile. P2003"Shire of Victoria Plains"/P2008"Shire of Carnamah" shunt their train at Mullewa on 28 July 1996. The train is actually on the line to Morawa but is setting back into Mullewa yard. P2003/P2008 were at the time permanently coupled together due to derailment damage. 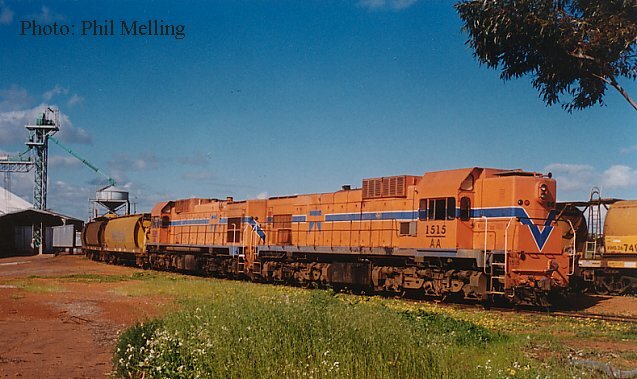 Just over a year from the above photograph, P2008 is again seen at Mullewa on 9 November 1997. The P had been overhauled and its derailment damage fixed and was the first existing narrow gauge unit to carry the new Westrail yellow livery. A colour scheme it was still carrying minus the Westrail name in January 2004. Less than a kilometre west of Mullewa Station is this cutting where we see AA1517/P2008 heading towards Mullewa on 28 June 1998. 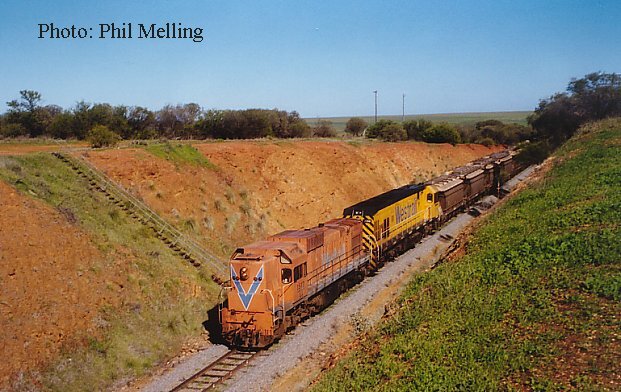 Westbound trains make quite a lot of noise climbing though this cutting with loaded grain trains for Geraldton.